If you’re looking for a spa break in a unique and beautiful city the Bath would be your perfect place. Bath has a blossoming city centre that you can shop until you drop but also offers quieter areas to relax and unwind. 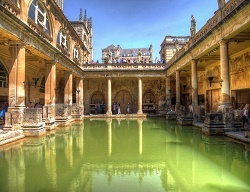 Bath is considered such a beautiful city that is had been selected as a World Heritage site. Bath has been thriving spa break destination for many years, this is partly due to the original roam style baths and naturally hot spa water that is located in the city. This is the only place in the UK that offers such an attraction. Bath is for hosting fabulous festivals, having a vibrant nightlife, great individual boutique shop and an extensive range of restaurants and cafes. Why not take a step back from the city and visit the Longleat Safari Park. If you would like a Spa Break with Bath on your doorstep then take a look at the Hilton Bath, this hotel offers you a pass into the famous Bath Thermae Spa. If you would like a quieter visit to bath then the Combe Grove Manor could the destination for you. Located just outside bath, this venue would offer you the quiet and relaxation of the country side with the ability to visit bath city at any time.